Slaves in America did not willingly accept their condition. Many slaves sought their freedom through several avenues, ranging from slave insurrections, physical escape and even suicide to more moderate but equally courageous paths such as self-purchase (emancipation using money earned on Sundays and through self-hire) and suing for their freedom in court. 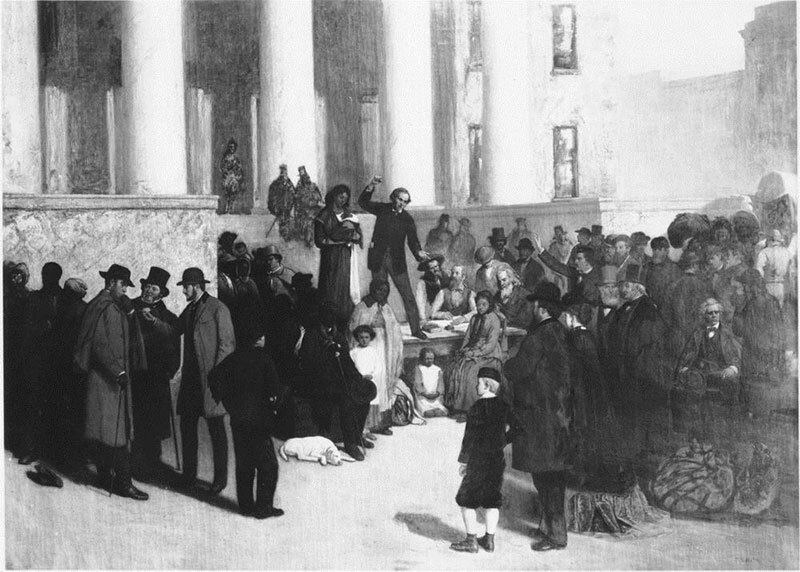 Photograph of a painting by Noble of the last slave sale on the east steps of the Old Courthouse. Courtesy of the National Park Service. Urban life for slaves was different than life on plantations. Urban life created a unique set of circumstances which, for some, held the possibility of escape in the various ways detailed in these lists. St. Louis was a cosmopolitan river city and it had the third busiest in port in the nation. St. Louis was very diverse in its citizens and opinions. In 1850, when Dred and Harriet Scott were suing for their freedom, St. Louis was a fast-growing city of over 80,000 residents, including 2,656 slaves and 1,398 free persons of color. African Americans were a part of this St. Louis environment from the time of its first settlement in 1764. Some of the early free blacks’ were prominent residents who were landowners and craftsmen. In 1804 when the United States assumed political control of St. Louis, life changed for many of the slaves who had lived under the French and Spanish systems. So-called "black laws" were written which added far more restrictive regulations to slave life. Missouri was admitted to the Union in 1821 amid controversy over the insistence of the St. Louis power elite that it would join the Union as a slave state. The Missouri Compromise of 1820 included the admission of the free state of Maine to maintain a balance of power in the U.S. Senate, averted a national crisis. Most of Missouri's slaves were agricultural workers who lived on farms along the Mississippi and Missouri rivers. It is difficult to stereotype the African-Americans in St. Louis during this time, where some persons of color were enslaved, others were free, and a select few were among the wealthiest citizens of the city. 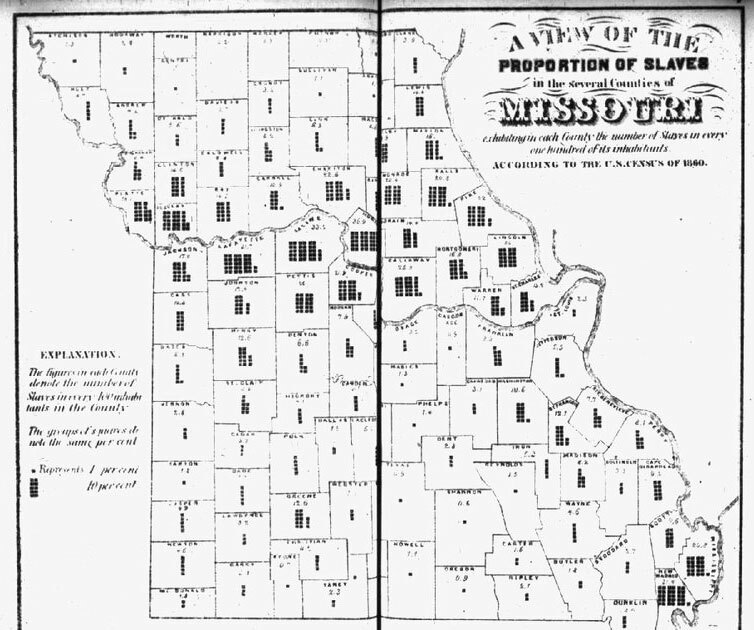 Map of proportion of slaves in Missouri, 1860. Courtesy of the National Park Service. 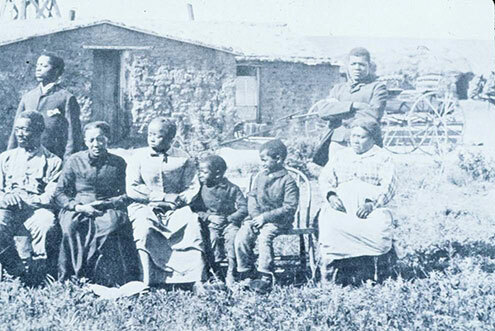 African American family posing outside their house. Courtesy of the National Park Service. German and Irish immigrants were changing the character of St. Louis, and by 1850 they composed 43% of the population. This affected slavery in the city because, for the price of a slave, one could also buy several years of work by a free common laborer, without the necessity of furnishing board, shelter, health care and clothing. With the growing number of immigrants, it made slave labor in the city unprofitable. It forced the slave owners to "hire out" their slaves to other people. There were times that slaves were able to keep some or all of these wages for themselves and work on Sundays and holidays to earn money. The County Court records of Freedom Licenses show a high number of emancipations during the antebellum era; and participation in a cross-section of professions in the African-American community of St. Louis. This suggests that many slaves were able to save part or all of their wages to purchase their own freedom. St. Louis slaves were not as isolated as their country counterparts. The first African American church was founded in St. Louis in 1835; slaves and free people of color began to attend their own church. Sundays became the day of rest for the city's slaves. Besides attending services they also spread news, gossip, and even hear newspaper readings given by literate people of color. In addition, many of the city's elite persons of color owned barber emporiums where important and wealthy white males gathered. This gave the black community far better information about the inner workings and thoughts of the white community than vice-versa and was knowledgeable about the state, regional, national and world events. 1. St. Louis enabled self-purchase. 2. St. Louis' close vicinity to Illinois, an allegedly free state. Allowed small number of slaves to sue for their freedom in St. Louis courts, based on the premise that they had been held as slaves for a period of time in an Illinois. 3. Slave Owners had come to see slavery as a moral wrong and freed their slaves. These freed slaves who wished to remain in the State of Missouri could obtain a license from the state. There were over 1,000 free blacks in St. Louis who owned small businesses, were laborers or worked odd jobs, there grew an elite group of African-Americans. These St. Louisans "the Colored Aristocracy" were large landowners and businesspersons, many descended from some of St. Louis' earliest residents.